A fun morning in Kanab, you’d hardly think we were supposed to hitch out and hike today. First I wrote emails to elected leaders and appointed officials asking them to keep our National Monuments in place; especially Bears Ears NM and Grand Staircase-Escalante NM. Then we resupplied at Honey’s (no beer, but they do sell kombucha). Chatted with Daybreaker and Don about living well (which doesn’t mean $$$), the challenges of Seattle, serving those in need. It makes me so proud of Daybreaker and his work with the Chicken Soup Brigade which is helping to serve people in need and the fundraising he is doing for CSB as part of this trip. Gabriel and I walked across town to have a delicious breakfast at Peekaboo Canyon Wood Fired Kitchen (asparagus and gouda omelettes, kale salad, good coffee). Yay for a veggie-focused menu! Then we picked up packages from the PO. We made reservations for the Sun-N-Sand. We’re not missing out on Don’s homemade peanut butter banana muffins. And hung out with Daybreaker for a little bit longer. Then it was time to get back to the trail. It took about 25 minutes to get a ride. A search and rescue helicopter pilot picked us up. Cool chatting with him about the places to explore around the Buckskin-Paria vicinity and preparedness for outdoor pursuits. A few pro tips if it turns out you aren’t prepared or stuff happens and you end up needing to be rescued: 1) make yourself visible, 2) know they’d rather do a rescue than a recovery, and 3) be grateful when the helicopter gets to you! Back to Buckskin Wash by 2 pm. We started to meander down canyon on cattle trails and the rocky cobbles of the wash. The canyon floor interspersed with single leaf ash, brilliant fushia-colored Zion vetchling, red paintbrush, purple thickleaf penstemon, and apricot globemallow growing amid sagebrush benches. Sign of big horn sheep and cow tracks. Whip tail lizards and cottontail rabbits darting across the wash.
We hiked by Trekker Bob and Fireweed, chatted with both of them for a bit – we all were enjoying the nice walking in the wash and anticipating the gulch. Gabriel and I were at the Buckskin Gulch TH by 5 pm. Day permits purchased, we were kinda torn. At this point we’d have a mere three hours in this remarkable place that others take trips just to see. A while back we’d decided not to take the Nick Barth alternate that sounds totally awesome and goes through the classic narrows and includes some fun scrambling up, over, and down a mesa. Throwing in a bonus trip to an already amazing hike seemed like it would be too much and would eat into our relaxing buffer time to re-enter the workaday world. Something we’d both felt while in Tanzania was that we didn’t want to do too much. We wanted the experiences of trekking up Kilimanjaro, going on safari, meeting exceptional people, and watching sunsets with Sarah to NOT be items checked off a bucket list or boasted about (been there, done that…). We wanted the details of these experiences to sear deep into our memories. Be part of our perspective. Let these thoughts settle before we go on to the next big thing. Likewise, that is how we have felt with the Hayduke. The route has taken us to spectacular places we’d only heard of or never knew existed. We are refining a growing list of canyons and mesas to return to and explore in detail, when our full focus will be on them. We do not want to check all the boxes this go around. For now, we are grateful for all we have seen and become aware of! The Hayduke has been our 200 level course on route to a lifetime minor on the canyons and deserts of the Colorado Plateau. 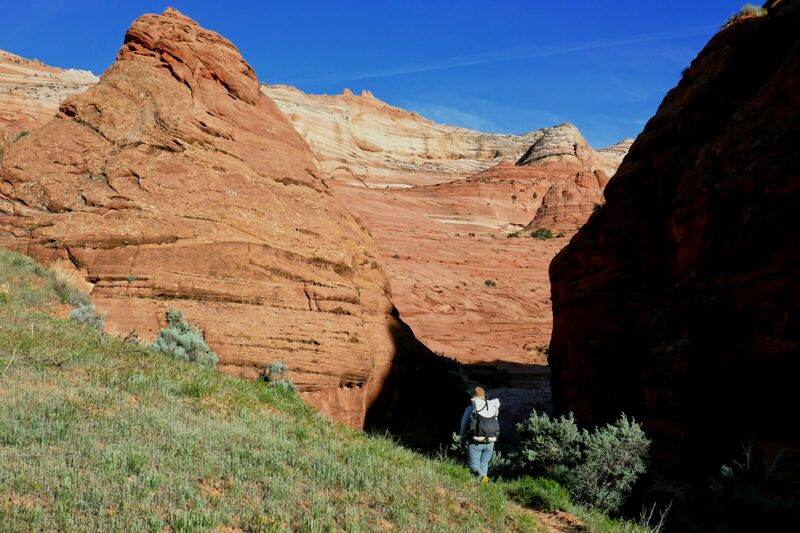 Buckskin Gulch-Paria Canyon, we’ll be back just for you. Good mindset in place, we hiked down the trail into the wash of brilliant red and orange hills; Navajo sandstone that guards the slot canyon of Buckskin Gulch. Gabriel walking ahead, mindful of the fact we need to be out of the canyon by dark and curious about the formations around the bend. Me, distracted already by flowering banana yucca, lupine, globemallow, fragrant cliffrose, jackrabbits, and a bull snake (which Gabriel walked right by!). A couple miles and bends later the wash transitions with rising sandstone walls coming closer together. A few alcoves rise up with hanging gardens. We feel as if we’ve stepped into another world. The sandstone is fluted and scalloped with details in the desert varnish. Brown, red, orange, black walls just a few feet across and hundred feet up. Late afternoon light and shadows have some walls glowing. The air is noticeably cooler. We slow to admire this place. Soon enough, we are at a giant wall with much detailed rock art. So many petroglyphs of bighorn sheep, trails, mountains. We wonder what they mean. The wall is also next to the exit through Wire Pass to the trailhead. We shimmy through the narrows. Have a minute of fun bouldering and a Mukmuk photo shoot. The fluted sandstone near the entrance of The Wave loos like a fine bench for dinner. We walk on by. Maybe we will when that lottery someday. Another bend and we are back out in the warm air of an open wash with golden evening light. The Navajo hills are fiery hues of red and orange in the desert glow. The air is rich with the sweet fragrance of cliffrose and Apache plume. Jackrabbits lope, cottontails scurry about. Crickets are chorusing. We stop and watch beetles doing yoga, inspect speckled insects new to us. At the Wire Pass Trailhead, we make a cowboy camp in the sagebrush. Then have dinner on the rocks by the interpretive signs. Bats fly about. The sky goes from the color of white wine and honey to pale peaches, purple, and finally the blue hues of twilight. Another beautiful and relaxing day on the Hayduke. Day 35: 13.9 miles; 542.6 miles total. Hwy 89 at Buckskin Wash to Wire Pass Trailhead. GPS: not needed; people sighted: Fireweed and Trekker Bob in Buckskin Wash and five other hikers, best of all: Daybreaker! ; roads: we crossed a couple. Gabriel on the trail to Buckskin Gulch. 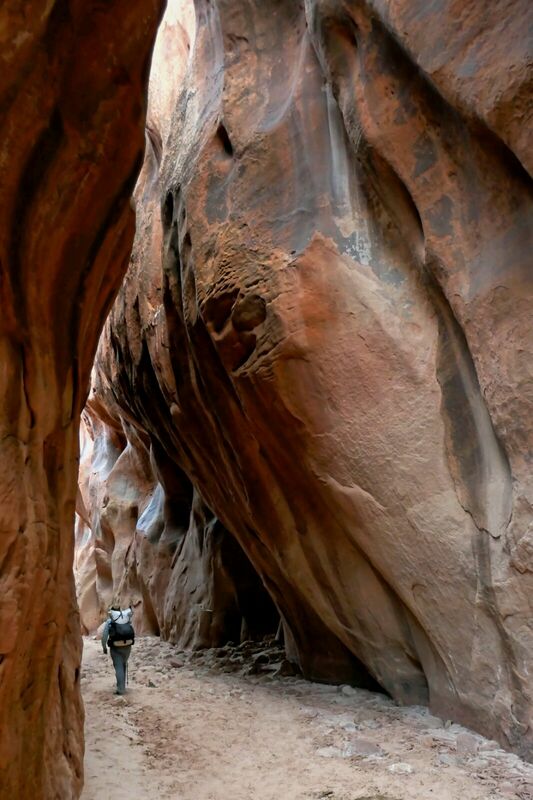 Nearing the first narrows of Buckskin Gulch. 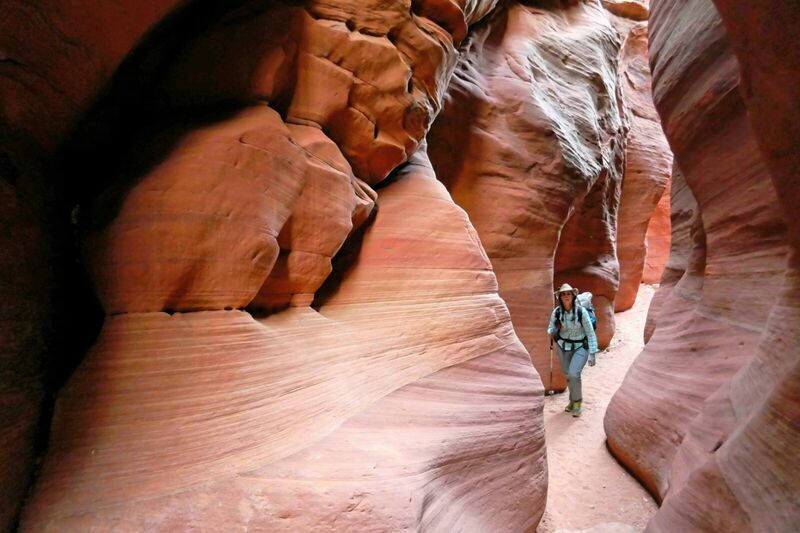 Water sculpts beautiful hallways into the sandstone. We look forward to lingering in these narrows someday. Patterns emerge on the surface of the rock. Gabriel resists taking a picture right this second. Large panel with rock art near Wire Pass. Taking time to smell the cliffrose. Sunset colors over the hills of Arizona. I so enjoy reading your posts and seeing your pictures because it’s fun to relive so many places I’ve been and see them through your eyes! And, reading your words makes me like feel I have gotten to know better in a way that I didn’t know you before. Thanks for sharing! I’m down with your philosophy of lingering. When Charlie and I were down in the Paria last year, we didn’t win “that” lottery either. *Shoulder shrug* Instead, we made the epic trip to White Pockets in the Vermillion Cliffs; it’s The Wave on steroids. No lottery or day pass needed. Sometimes it pays to roll with it. Can we kick it? Yes we can.